emmatree: Home. Place. Further. Place. Home. It has just gone dark outside, almost 8 o'clock, on the tv The Prince of Tides, background for the evening, this first evening of later daylight. I spent the weekend and Friday night keeping company with all the bits and bobs of lovely sneezy stuff that waft through in the March air, a slight, slight fever, just enough to make me stay home; Maggie to the vet Saturday morning and a ride through the countryside - photo safari-ing - enough to convince me to do nothing. I was in the front door and out of my boots in 2 minutes and there they stayed until yesterday, so prettily posing. But yesterday woke me up, my very favorite day of the year, an hour of lost sleep easy payment for the joy of leaving work by sunlight instead of moonlight, for the peace of an hour on the couch with Maggie in my lap, watching the daylight slip away - easy, easy payment; I am glad to sign the check. Awakened and energized, still a slight bit of fever, I cleaned, needing the dust of winter out the door. I guiltily rearranged unused art supplies, I moved the stereo, I found a better spot to store small paintings (apparently good feng-shui; an email awaited me this morning, a painting and a photograph sold), I vacuumed and swept and tossed out old apples, TCM on the tv, old movies passing by me, Katherine Hepburn in Venice, Where the Boys Are in Ft. Lauderdale. All in pajama bottoms and a tshirt. I sat for an hour in the late afternoon in a child's chair in the open doorway, Maggie on my lap for almost an hour and then I followed her into the yard, into the sun, and we watched an elderly couple inspect the-house-next-door-for-sale, the one with the white pillars and the red door, we watched skateboarders on the brick street, flying down from the hill, leveling off in front of the house, we watched parents with strollers stroll by, we watched 2 young girls gathering fallen tulip tree blossoms for bouquets, and a young boy picking paperwhites for his mother, his entire family out for a Sunday afternoon walk. I have three articles to be published this year in Somerset Life. The first will be out in a couple of weeks; they are each about a sense of place, which means I have been thinking about that sense of place more than I usually do, and in fact that thinking was behind that bit of Saturday's photo safari-ing, a need to get re-acquainted with this place I call home. I felt lost - not geographically - but lost in thinking about the here where I live, realizing I am ruined, this neighborhood such a place of enchantment, as a neighbor so eloquently put it. In the springtime, my drive to work changes, I turn right right there at the corner just past that house-next-door-for-sale - I turn right to see if the owl is in his spot in the tree, and later, in the summer, I turn left, out of my way, to drive by the pale pink crepe myrtle tree I love so much, and circle around the block before heading off to work. It is hard to top a neighborhood that can entice you to drive in different directions to reach the same spot. The sound on the tv is off but I see Nick Nolte's character moving between his southern oceanside home and New York City. Maggie is back in from the outside, looking for her place in my lap but it has been stolen by the computer, and I, who have a need to feel I will see her later, after she is gone, tell her stories of heaven I learned in childhood, but not really, it's a heaven I've evolved from those stories; I tell her she won't be lonely, that my father will be waiting, that he is much like me, that they will be friends, that she must wait for me there. In that place. Of course, the stories are for me, I cannot bear to think of her not here, not in this place. I've heard it said that for a dog, home is where you are, but for a cat, home is home, their place is home - you just happen to be there. They are both right, of course. I know what I will write for that 3rd article, I know how it will go, it is just a matter of putting the words in the right place, so to speak. my son feels the same, it is his favorite day of the year. i guess i am old. and cranky. and i think you are just right about cats, and dogs. love the boots, like you are still in them. It's been so many decades since I took ballet...are your boots in a demi-plie?? Hey - love your boots. They look well-traveled and extremely comfortable. A good pair of boots is the most comfortable walkin' ever. Congratulations on your articles for Somerset Life. I don't get that magazine, but perhaps I'll have to pick one up to see your article! Three articles? Yeah!!! Stories of Maggie always pinch my heart a little. My Sammy is 14 and walking slow and limpy these days. When he requests my lap, I push aside the computer and any other kitties residing there. He is the king and I cherish every moment with him while I can. just now, reading your words, I spent a day with you.....and I liked it. i was just thinking the same thing Beth said - like i spent the day with you. 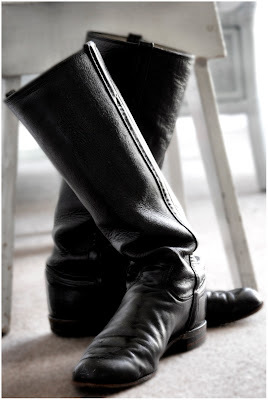 and before i even read your words i sensed you in those great boots. it's so wonderful coming here - so welcoming and i know it's every bit as enchanting as you paint it . love that photo by the way. your writing, your images - they bring me to such a place of ease. your book - I dream of reading it, finding myself in the place so close to Heaven. thank you for your words. for mentioning Heaven. ah Heaven. angels be with you dear. so grateful for having found you. i would say those boots and the feng shui are really encouraging you...sold paintings and articles ...your talent and passion are there for me to enjoy each time I click on "emma tree"
so happy about the articles :) you have evolved from blogger to published author to 'eagerly anticipating new work author' over the past year and that is such a wonderful and well deserved evolution! You, more than anyone else, hold on to your chosen yearly word, and fly with it. Your magical neighborhood is putting spells on you. Can you bottle some of that magic?